The best time of year to start a raw food diet is in the Spring and Summer. It suits the body best to make changes between March and September, and then work on maintaining those changes from September through to March. Many people start raw in the warmer months, and then don’t feel they can maintain it, and revert back to their previous normal diet during the Winter. It is possible to do a raw diet when its cold, just much harder! If you’re looking for advice on how to make raw sustainable throughout the year, including the long cold dark winter months, then this is the video for you. There are certain things you need to understand to sustain a raw diet when the sun isn’t out, otherwise it can be detrimental to your health to try and be living on salads and smoothies in December, but once you’ve grasped the basic principles, it’s straightforward. Just ask the Scandinavians – despite having really harsh winters, there is a thriving raw food scene in the Scandinavian countries, particularly Iceland. 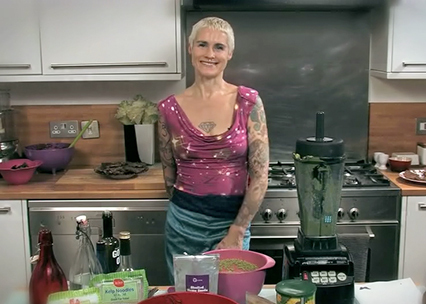 Included in this video is a demonstration of an alkalising warming winter soup recipe, Green Goddess Soup. Kate talks about raw soups, and gives guidelines on preparing and serving them. Kelp noodles are featured in the recipe, and a full explanation of what they are and how to use this most popular of raw ingredients. This video is worth it just for the kelp noodle info and the soup recipe alone! A downloadable PDF with the full recipe instructions on it is included. The best time of year to start a raw food diet is in the Spring and Summer. It is possible to do a raw diet when it's cold, just much harder! If you're looking for advice on how to make raw sustainable during the long dark winter months then this is the video for you. Kate Magic is one of my biggest gurus and the discoveries I have made through her have had a massive impact on my life. I’ve lost count of the amount of people I have sung her praises to. I learned so much from her, she really strikes a chord with me.